Jerry Garcia could be truckin' to a cosmic IMAX 3D cinema near you very soon. According to reports, a script about the late Grateful Dead leader has been completed and a director is in place. Written by Topper Lilien, who based his screenplay on author Robert Greenfield's Dark Star, the film will be directed by Amir Bar-Lev. Bar-Lev has recently received accolades for The Tillman Story, a documentary about deceased soldier and former NFL player Pat Tillman. The still-untitled Garcia film is set to detail the late guitarist/singer's life before the Grateful Dead era. 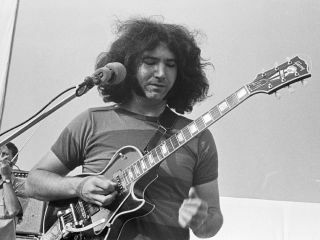 Garcia was born on 1 August 1942 in San Francisco and had his right middle finger partially amputated at age four in a wood chopping accident. The loss of his digit would later serve as fodder for Deadheads as to why he could ease through guitar chords with such fluidity. Still, the question remains, who should play Garcia? Since the movie will focus primarily on the pre-Dead years, a young actor is being sought, and names such as Joseph Gordon-Levitt (Inception) and Seth Rogen (Knocked Up, Funny People) have been tossed about. As of yet, nobody is firmly attached. Interestingly, this project has been percolating for some time, and back in 2008 we suggested Jack Black for the role. So what do you think? Did we nail it, or is there somebody better suited to portray Jerry?